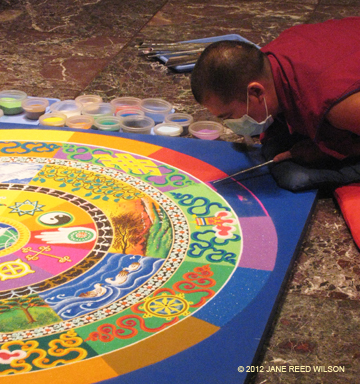 This entry was posted in Uncategorized and tagged art, constantly creative, creativity, design, drawing, Drepung Gomang Monastery, Jane Dashfield, Jane Reed Wilson, Kansas, photography, sand mandala, Spencer Art Museum, Tibetan Buddhist, University of Kansas, watercolor, writing. Bookmark the permalink. 2 Responses to Do creative projects have a lifespan? This is a beautiful post and a subject I keep coming back to over and over again. Thank you for writing about it so tenderly. I am also a daighter of a highly artistic and creative mom, and I now have artistic and creative children, and our home is bursting with creations! I feel a need to “let go” and also to hold onto a few precious things. Deciding which is the hard part. Thanks, Jen. I know I’m not alone in my thoughts. With that rich creative legacy comes responsibility and decision. I try to use or display (or wear!) as much of her creative work as I can. I like the idea of usable art. Leaving it in the dark doesn’t do it justice. I have coffee every morning on a tray she made and it makes me smile. Blessings to you and your creative family!